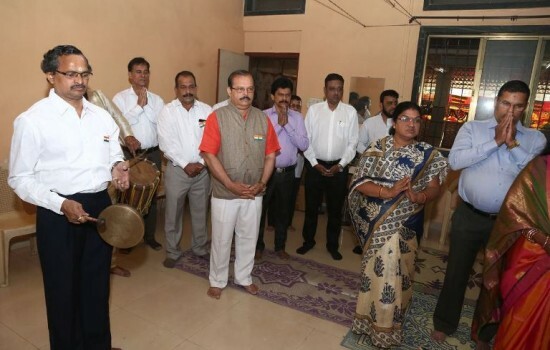 At Devadiga Bhavan – Regional Cultural Centre, Nerul (West), Navi Mumbai. The Day which most of the Mumbai Devadigas eargerly awaited...!! 'Smile and celebrate every day like a festival'. This is what Devadiga Sangha Mumbai Youth Wing along with Mahila Vibhag tried to do on 26th January, 2018 and yes of course it was like a Fest for all Devadigas. 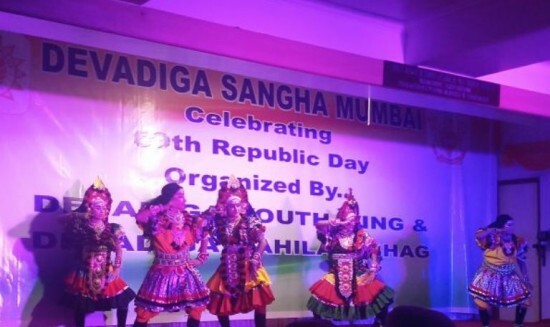 This opportunity to explore the talents was indeed given by Devadiga Sangha Mumbai. The Objective of this program was to provide platform for better networking within Devadiga community members, provide platform to Talents in the community & gain confidence, learn about new developments & keep ourselves updated. Also to initiate Go Green concept. The program was entirely managed by Youth Wing along with Mahila Vibhag, with the support of the Managing Committee of the Sangha. 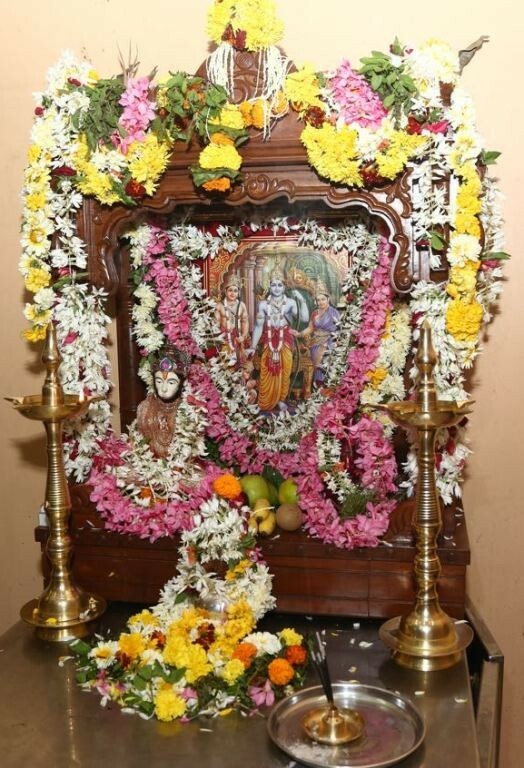 The Day started with Shree Satyanarayana Pooja at 08:30 am.Pooja was performed by recently married couple Mr. Vishal R. Moily & Mrs. Shradha V. Moily, son and Daughter-in-law of Smt Jayanthi Raghu Moily, Chairperson Mahila Vibhag. Managing Committee members as well as other members were present at the time of Pooja. 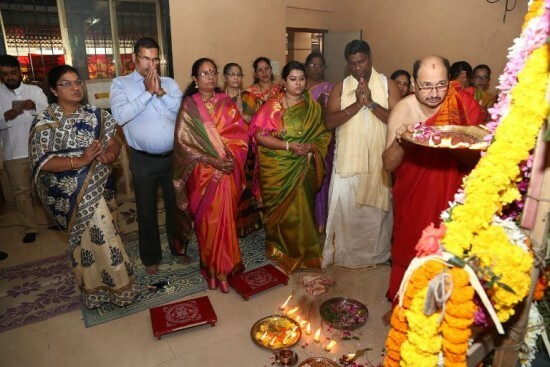 “Mangala aarti” concluded the Pooja & Teertha Prasad was served to all the devotees thereafter. 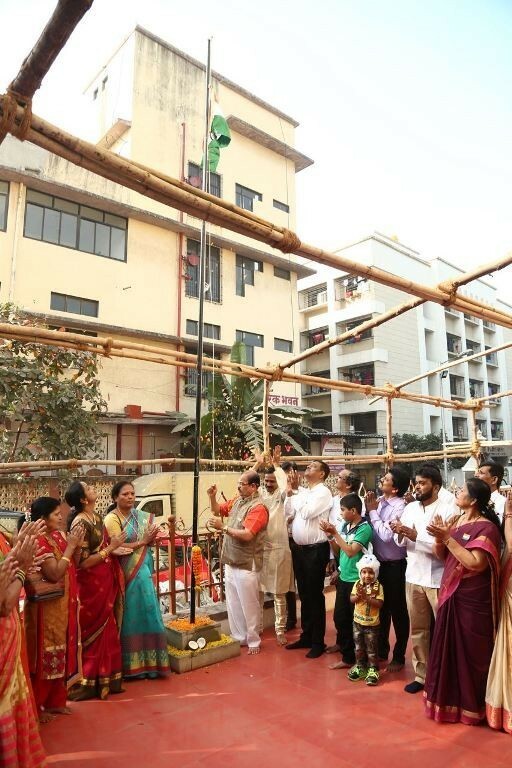 To mark the 69th Republic Day, Shri Ravi S Devadiga, President Devadiga Sangha Mumbai hoisted the national flag around 9.30 am and all the members assembled and sang the National Anthem. President Mr. Ravi S Devadiga shared his thoughts about Republic day and wished everyone on the occasion. Delicious breakfast arranged on the occasion. 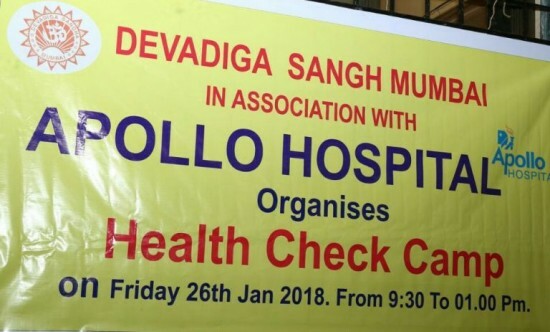 The Medical Guidance Centre of the Sangha arranged Medical Camp under the supervision of Mr. Janardhan Devadiga Chairman, Medical Guidance Centre, in association with Apollo Hospital Belapur, Navi Mumbai. 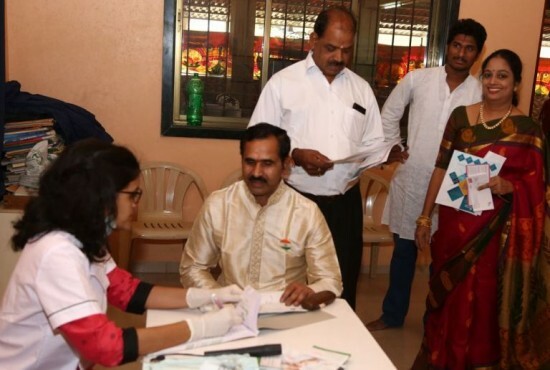 The Camp was inaugurated by President Shri Ravi S Devadiga The medical camp covered Dental checkup, Diabetes, Cancer Checkup, etc., and around 150 members had taken the benefit of the Medical Camp. 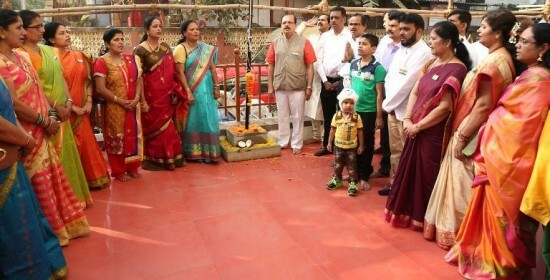 Mr. Ravi S Devadiga, President, Mrs. Jayanthi R. Moily Chairperson, Mahila Vibhag and Mr. Praneeth Devadiga, Chairman Youth Wing were invited to the stage by Youth Joint Secretary Ms. Lata Devadiga to inaugurate the program by lighting a lamp and Ms. Shreya Devadiga, Mr. Sachin Devadiga, recited the “Eee jokulen kaapula”, a nice Ganapati Prayer. Thereafter the stage was taken over by our talented &energetic hosts Mr. Abhishek Devadiga & Ms. Sonali Devadiga who welcomed the guests and audience. Sangha’s Hon. Gen. Secretary Mr. Vishwanath Devadiga extended a warm welcome to all the members present and he requested everyone to keep up the support. 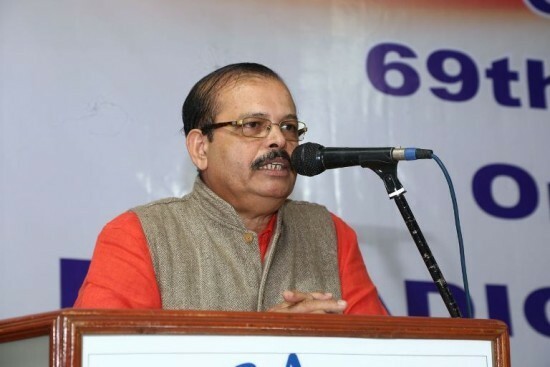 Thereafter President Mr. Ravi S Devadiga addressed the audience and welcomed everyone in the audience and invited all to attend the community program at Ekanatheshwari Temple, Barkur from 19th Feb to 22nd Feb 2018 and he conveyed his good wishes again. 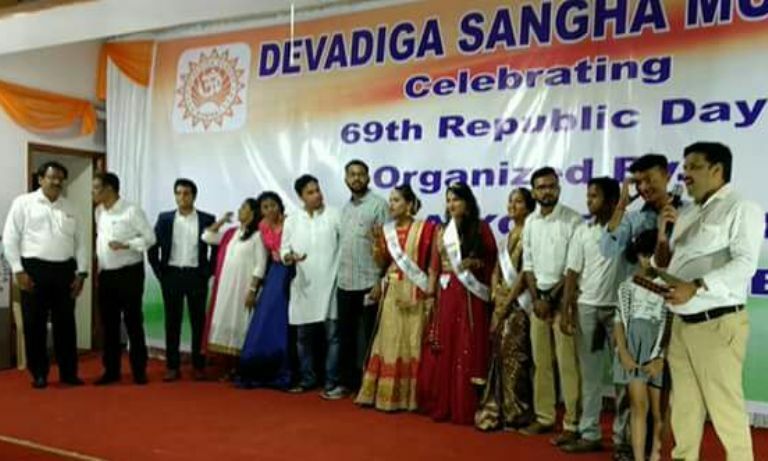 Youth Mentor and guide Mr. Girish Devadiga presented slideshow on the major activities performed by Devadiga Sangha youth wing since formation of new Youth Team. Announced core Youth team members list of DYW. Strengthen Youth membership and Youth active participation. Create platform for knowledge evolvement on Education, Career (personally and professionally), Personality development and any such activity for the betterment and knowledge enhancement our community members especially for Youth. Organize relevant program to create platform for Devadiga/s to show their talents in Sports, Cultural Activity and Competitive Test. Recognition of Talents and Performers (Avaansh), invent and introduction of new ways and means for membership and funds mobilization, Improve community Network, organize charity programs, etc., with the objective towards making our community strong & self-sufficient. Football by Youth Dombivili region. 1st Kabbadi tournament by Youth New Mumbai region. The Youth from City LCC had organized Swayam Prerna. The words itself says “Inspired by oneself”. It was a platform created for the speakers to deliver their experiences, ups & downs of their life, their hard work & mantra to be a successful person, as well as to listeners to learn & gain knowledge from them. 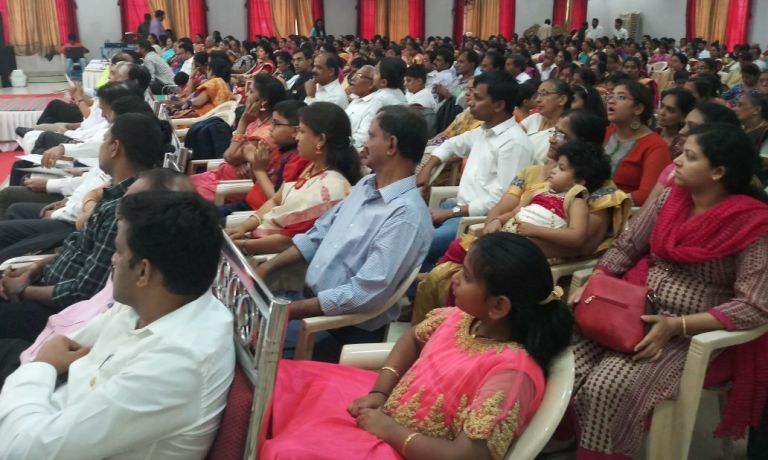 The program was well coordinated by City LCC young talents Mr. Brijesh Nittekar and Mr. Prashant Rao and invited speakers from our own community members who have succeeded in their professional line such as Mr. Praveen Narayan, Mrs. Bharati Nittekar, Mr. Ravi Ullal and Mr. Naresh Devadiga. At the start, Mr. Hemnath Devadiga City LCC chairman had shared the brief about the program. Bollywood & Belly dance an excellent performance by little wonder baby Samudhayata Devadiga from Mira Rd LCC. Contemporary dance by Mr. Praveen Devadiga, City LCC. Solo Danceby Ms. Harshita Devadiga, Bhandup LCC. 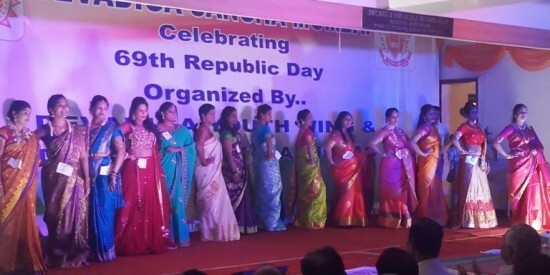 Patriotic Dance by Ms. Soumya and Veena Devadiga of Jogeshwari LCC. Yakshagana Group Dance by Devadiga Kalavidharu. Mime Act of “Is Gandhiji still our Bapu” by Youth Asalpha LCC. “Save the Girl Child” a fashion show by Bhandup LCC. Standup Comedy by Vignesh Devadiga, Dombivli LCC. Solo dance by Tanvi D. Devadiga, Navi Mumbai LCC. Group Dance by Youth Asalpha LCC. Group Dance by Ms. Soumya & Veena Devadiga, Jogeshwari LCC. Solo western dance by Baby Sidhvika Devadiga. Maharashtrian Folk dance by Devadiga Kalavidharu. “Pili dance” by Dombivli LCC. Social message a play by Dombivli LCC. Bahubali dance by Master Atish Devadiga, Asalpha LCC. *Baby Vidhi Karmaran, Dombivali LCC. Immediately after the lunch, the most awaited show for women “Mrs. Devadiga” began. There were 20 participants. This competition was scheduled to have 3 rounds with Western Wear, Traditional getup and Q&A round. All the participants presented themselves very gracefully and walked the Ramp with confidence. 8 contestants got selected for final Round of Q&A session. The entire event was Judged by professionals Mr. Prasanna Devadiga and Mr. Harshad Bhudkar. All the participants in Q&A session had shared their best answer with confidence amidst a huge applause from the audience. 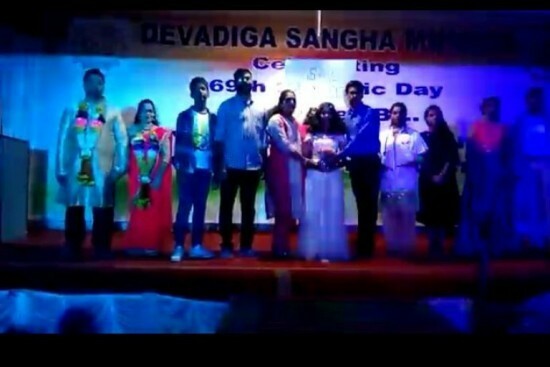 Following were announced as winners of Mrs. Devadiga. 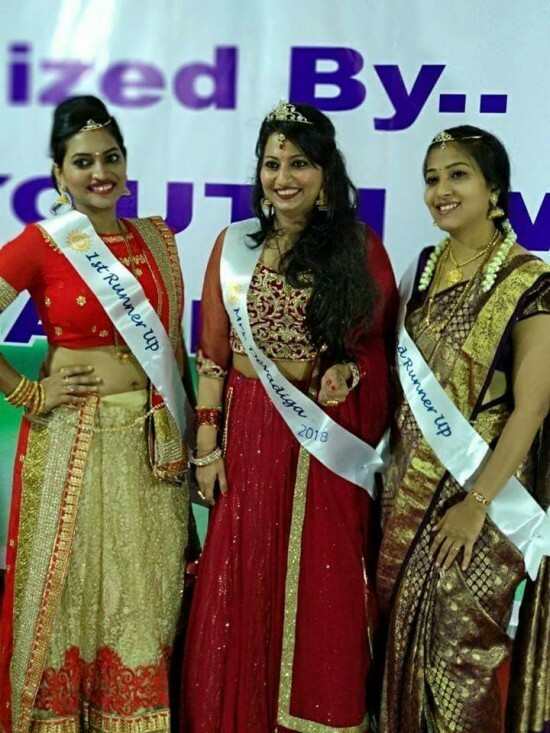 The winners were awarded by Women’s wing senior members with Crown, Sash, Gifts and Sapling. 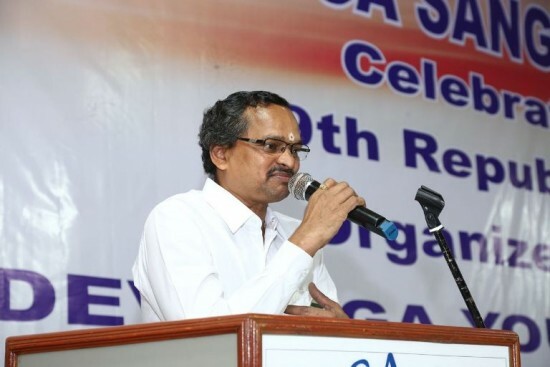 Mr. H Mohandas, Ex. President who celebrated his birthday on 26th January was honoured with a sapling by Mr. Ravi Devadiga, President and entire Devadiga Community present wished him a very Happy birthday and wished for long and healthy life. Before starting the stage function of Mahila Vibhag, a presentation, about the brief activities of our Devadiga Mahila Vibhag done during the year was shown. In that activities like celebration of International Women’s day, Sharada Pooja, visit to elder’s house, Trip to Hyderabad etc. were highlighted. 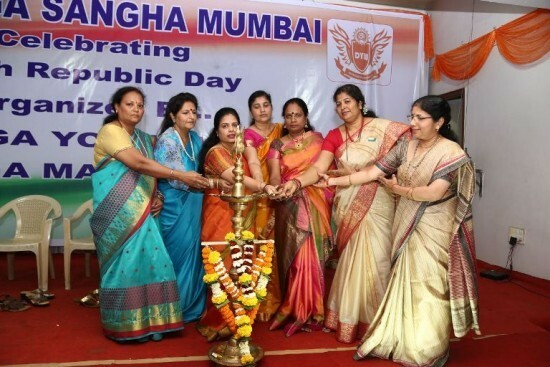 The stage program was arranged by Purnima Devadiga (Secretary, Mahila Vibhag), who requested Mrs. Jayanthi Raghu Moily – (Chairperson Devadiga Mahila Vibhag) to take the seat on the dias. 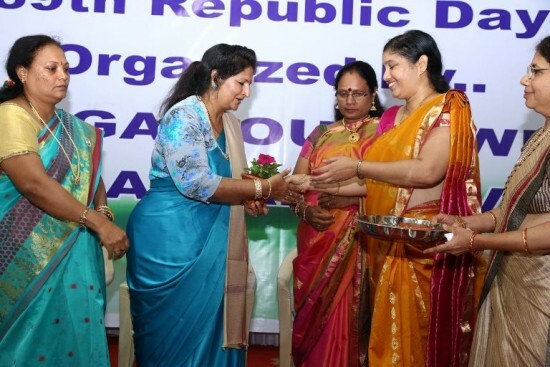 The guests of the function were Mrs Vanitha R. Devadiga and Mrs. Jayashree D. Attavar who were invited to the dias along with Mrs. Ranjini Moily (Vice-Chairperson), Mrs. Surekha Devadiga -Vice Chairperson (Cultural), Mrs. Purnima Devadiga – Secretary and Mrs. Pramila Sherigar – Jt. Secretary. This was followed by lighting of lamp by the ladies on the dias, a beautiful prayer was recited by Mrs Uma Sherigar and Mrs Amita Rao. The welcome speech was given by our chairperson Mrs. Jayantihi Moily. 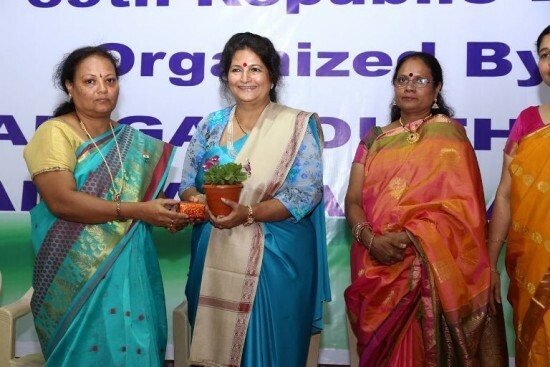 Mrs.Purnima Devadiga, Secretary- Devadiga Mahila Vibhag briefed the audience about the activity that the ladies performed throughout the year. Surekha Devadiga gave a brief introduction about Mrs. Jayashree D Attavar. Ranjini Moily introduced Mrs. Vanitha R. Devadiga, wife of our President Mr. Ravi Devadiga. Shweta Devadiga a young practicing Homeopath was felicitated by Devadiga Mahila Vibhag and Guests and she spoke a few words. Mrs. Surekha Devadiga gave away the prizes of the winners of Hyderabad Picnic games. Mrs Ranjini Moily read the names of the donors who contributed whole heartedly for the Arasina Kumkuma program. Vote of thanks was conveyed by Mrs. Pramila Sherigar. As the stage program in progress, women’s wing started Haldi kumkum program and offered Arasina Kumkuma to all the married women’s present and offered “Tilgul & laddu” to all in addition to the gift of Copper Plate to all the women. There were 230 ladies who attended the program including around 60 girls. It was for the 1st time in a youth program, a concept of lucky coupon was introduced, to mobilize fund for education purpose. The lucky winners were given saplings. The coupon was priced Rs.50/- Along with this a new concept of recognizing maximum participation was introduced i.e. max participation in the event, max audience and max mobilizer of membership at LCC level, for the 1st time to encourage all our community members to work towards the same. The following LCC had been recognized in these categories. Navi Mumbai LCC - Highest audience. Dombivili LCC - Highest participation on Stage. All the winners were awarded Saplings by present and past senior Managing Committee members. Mr. Girish Devadiga (Mentor – Youth Wing) introduced the entire team Mr. Praneet Devadiga, Mr. Harish Devadiga, Mr. Atish Devadiga, Mr. Shivsagar Devadiga Mr. Nithesh Devadiga, Ms. Soumyalata Devadiga, Mr. Abhishek Devadiga & Ms. Sonali Devadiga, who had worked hard to make the event a success. All of them were thoroughly appreciated by huge rounds of applause by the audience. If time is money then today, you all have spent millions for us..!! The unforgettable moments it was, no one left the place till the end and everyone appreciated the way the program was organized. The participants, the winners and those who did not make it to the finals have expressed their happiness and thanks for organizing such an event and creating such a platform. The day was full of memories. From Dance to Drama, the kids were brilliant throughout the day. The talents were outstanding. The Hosts for the show were well charged till the end, getting on to be anchors and entertainers moulded in one. On this day we danced, laughed, smiled, cried, enjoyed ourselves & impressed all with the initiative of the Go Green concept. 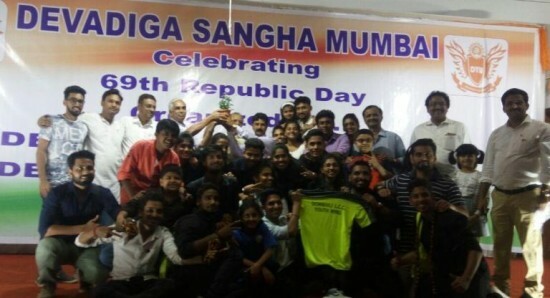 Ravi Devadiga, President Devadiga Sangha Mumbai for showing confidence and extending desired support. 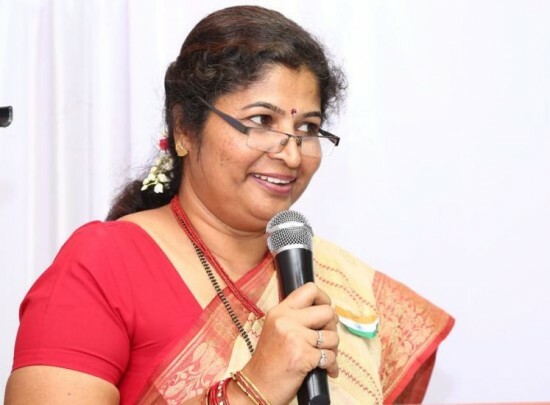 Jayanthi R. Moily, Mahila Vibhag Chairperson and entire Mahila Vibhag for all the supports and assistance. Janardhan Devadiga, Social/Cultural & Medical Chairman for conducting Medical Camp. Managing Committee members for showing confidence on youth wing. Abhishek Devadiga & Ms. Sonali Devadiga for being wonderful hosts. Prabhakar Devadiga for entire event coverage & photography. Mentors Mr. Pravin Narayan Devadiga, Mr. Naresh Devadiga & Mr. Girish Devadiga for direction, guidance and assistance since the beginning of this project. Most importantly showing confidence in youth. 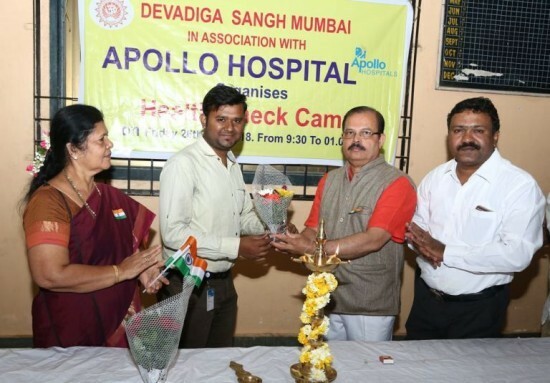 Doctors and Supporting staff from Apollo Hospital for all the assistance in medical camp. All the LCC’s for their supports and assistance. Finally Mr. Jarappa Devadiga, Manager – Devadiga Bhavan Nerul for his assistance as always.